Recently Republican President nominee Donald J Trump was seen in a bizarre advertisement campaign wishing Indian Community “Happy Diwali”, in the same video he was also seen quoting his version of Prime Minister Modi’s 2014 election tagline – “Ab ki bar Trump sarkar”. 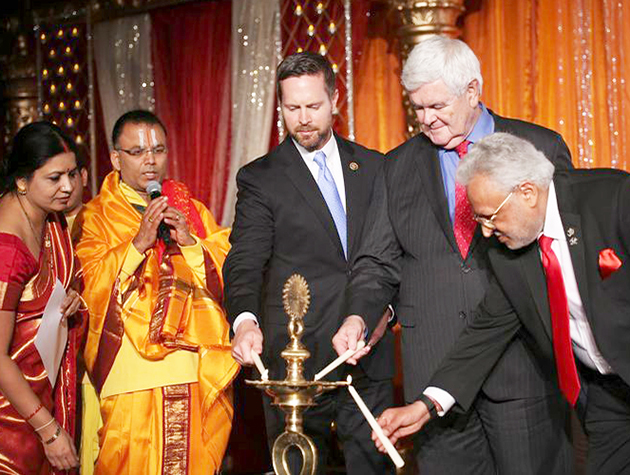 Earlier this month at a fundraiser hosted by the Republican Hindu Coalition, Mr Trump was seen praising Hindus, and Indian community. In his speech he ensured that, “The Indian and Hindu community will have a true friend in the White House,” under his administration. In May 2016 a Hindu Nationalist organisation, ‘Hindu Sena’ also held a havan puja at New Delhi’s Jantar Mantar in support of Mr Trump. However, it is hard to digest the fact that these organisations (who claim to represent ‘Hindus’) are supporting a beef seller, and beef consumer. Yes, a beef seller. To many who are unaware of the fact that apart from real estate, Donald Trump also used to own a steaks company called Trump steaks. You saw how he ends by saying stakes are his Favourite food. It is ironic how Hindu Sena on one hand urged PM Modi to impose the ban on beef in India last year, while on the other hand supports the Beef consumer Donald J Trump. It is also astonishing that the Right wing Republican Hindu Coalition, who claims to build a strong Hindu American voice in Washington, is okay with beef sellers. Maybe beef is not an issue for them, unlike our right-winger organisations, who seems to believe that beef ban is as important as giving employment to every Indian. Apart from your abuses, let us know your views in the comment box below.